Hotel La Tartane Saint Amour lies on the outskirts of the town of St. Tropez in southern France on the road to the beaches of Pampelonne. It has a faintly quirky charm all its own. The peaceful and tree shaded grounds house the 20 rooms and 8 suites spread out in numerous independent groupings all with their own terrace or balcony. It is far enough outside the town (about 5 minutes by car) that the peace is unbroken but close enough to whip in to to the the Caves du Roi disko, shopping in the plethora of designer stores or just sip something cold and watch the endless games of boules or the boats in the harbor. You can drive yourself and fight for parking places or use the hotel's shuttle. Our room was spacious and attractive with an African - Asian motif. 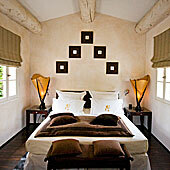 Most of the rooms and suites have massive exposed beams adding to the "in country" feeling. It was comfortable with a seating area that leads out to the large private terrace. The quirky aspect to our junior suite extended to the bathroom. An overabundance of mosaic tile spread from the twin sink area to a separated shower and bath-tub. The tub was a bit awkward to maneuver but that did not deter us from enjoying our stay. Full amenities, free WiFi & Internet connection and Carita Harris products in the bathroom. The maid service tended to enjoy themselves to the extent of intruding on the peace of the rooms, but were friendly and helpful throughout. he rather utilitarian entrance does not hint at the more attractive campus that extends behind it and it is easy to pass right over the rather charming Koy pond that runs under the equally utilitarian entrance decking. Old books are piled up in tall columns, some making floor lamps. A bit dark and murky on entering but once you pass on through to the open bar and the St. Amour restaurant that focus on outdoor dining and entertainment with shade provided by the huge fronds of the palm trees that pull the whole area together. There is an inside small bar for inclement weather as well as a large country fire place and comfortable sectional seating that surrounds it. This extends into the main indoor dining room for their Asian-Fusion restaurant "Le Grand Café." But this is a location devoted to the great out of doors and summer sun. A large pool is the focal point and extends out from the bar seating areas. With an additional quirk of design, someone decided to float a dozen or so large silver spheres in the pool that clink together as the breeze blows them hither and yon. So for visitors with a penchant for disciplined swimming of laps - heads up. There are large pillow mattresses, chaises longues and plenty of market umbrellas. Near the pool is a small wooden garden structure that holds the exercise equipment and a small salon that could well be used for their advertised spa. Pathways lead around the through the complex of cottages with fountains and their happy tinkle of falling water scattered around as well as many pots of geraniums, shade trees and bushes. In spring, when we were there, the star jasmine that covers whole walls was in full bloom and the air was scented with their heavenly aroma. The main restaurant of Hotel La Tartane Saint Amour, St. Tropez, "Le Grand Café", has a very French name for a really good and refined Indo-Chinese cuisine and despite its oddly applied name is a welcome addition to the St. Tropez dining scene. Chef Koy blends the flavors of Asia with a light and inventive touch and his distinctive style of fusion would bring us back again. 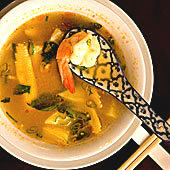 Peter's "Tom Yon" soup with Mediterranean prawns, ginger and pineapple, was complex and excellent. My Steamed duck crêpes were enough for a light meal and were perfectly prepared. Peter followed the soup with the chef's signature fish dish of "La Dorade Royale" (Dorade is a small fish with tender white flesh, silver skin and, when grilled or braised, a rich, succulent, meaty flavor, similar to that of pompano or red snapper.) in coconut wrapped in banana leaves which he exclaimed was fantastic! High praise indeed. My chicken in a light green curry sauce was delicious. The side dish of steamed vegetables with chives, coriander and ginger was prepared to just the right firmness of vegetables and the ginger added the finishing touch. We split the dessert of a soup of mango, coconut and tapioca that was a perfect compliment to the meal. Chef Koy creates a fusion cuisine well worth an overnight stop or at least a different experience in this wildly popular and entertaining town. Chef Koy arrived in Paris in 1990 where he worked for about 10 years in a restaurant on the Champs-Elysee that specialized in Indochine cuisine. From 2000 on, he has worked at "Le Grand Café" at St. Tropez and at our hotel in Courchevel serving a international blend of diners. The St. Amour restaurant serves the rest of the nourishment from lunch to other light meals mostly outside on the palm shaded patio and out by the pool. It is connected with the bar one morphing into the other. The food is mainly an international blend of dishes owing allegiance to no particular country, is pleasantly prepared and tasty. In the morning a lavish and really well done breakfast buffet is a very happy way to start your day. Fax : +33 (0)4 94 97 09 16.